All photos link to the original blog post. Today I decided to take a break from the 31 day challenge and hard reboot my nails. This meant soak them in an oil concoction, shape my cuticles, moisturize, cut, file and shape them. I will double up on prompts some time by the weekend. I still wanted to post today when I realized I had not yet done my December showcase! So, I picked a handful of manicures and got to work. Check out my Pinterest page (here) for my other favorites! Roselynn created this manicure for the Challenge Your Nail Art December series. I love everything about this manicure. The lights pop against the white base and the shading makes the bulbs glow. It is a cute holiday manicure. Let’s talk about how ridiculous this manicure is. Ali created sweaters for her nails; she actually made sweaters. She stamped sweater designs over flocking powder and embellished with rhinestones. This blows my mind because A) the flocking powder doesn’t look messy and B) the stamping is so crisp! I can’t even. Just wow. Sammy’s short nail manicures are so accessible to me because I prefer to keep my own nails short. I have a soft spot for snowflakes, purple and simple festive designs. Sammy always reminds me simple can be even more gorgeous than busy designs. Gemma always stamps perfectly. It is no surprise I was blown away by her gradient stamping. The colors are so icy and the base color finishes the whole look. I was super jealous of this manicure because I had tried my first gradient stamp and while the stamping came out crisp the color came out marbled and muddy! Sorry for the super large picture but it was hard to see any smaller! I have been on a makeup slump the last few months. I did not try new makeup nor wear different looks. 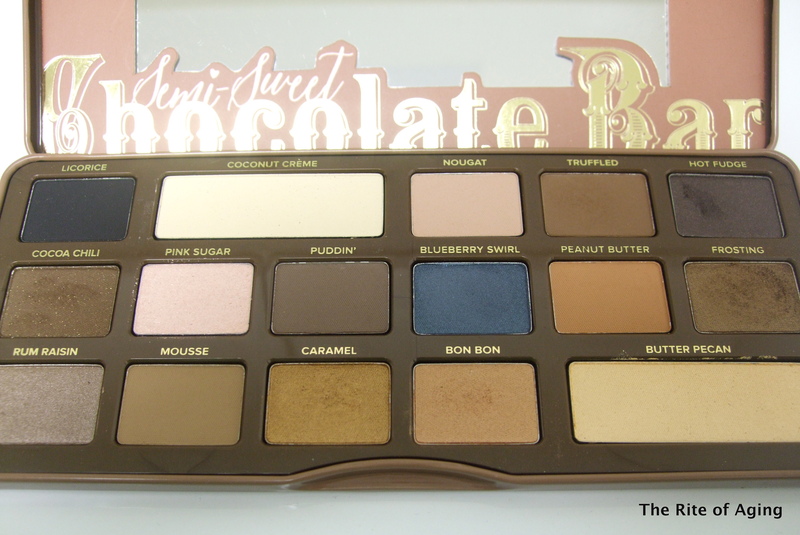 I was in a rut until I received an email from Sephora allowing VIBs early access to the new Too Faced Semi Sweet Chocolate Bar palette. This email came at an opportune time when I realized the eyeshadows in the original palette leaned cooler purple and were unflattering on me in the paler winter months. Generally, at any time of the year, I opt for warmer more bronze-gold shades and this new semisweet palette offers them. The eyeshadows do not smell as chocolatey as the first ones do but otherwise the shadows blend well, there is not a lot of fallout, and there is a good mix of matte and glitter-y shadows. wow I’ve never seen anything like this before! Thank you Julia! These nail arts are from other bloggers or Instagrammers, I just showcase my favorites once a month!